The World No. 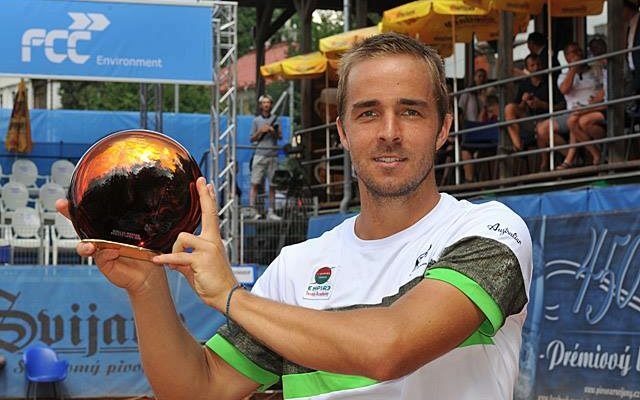 213 from Slovakia clinched his eighth ATP Challenger crown. Following his triumph in 2014 Andrej Martin captured his second ATP Challenger title in Liberec, winning the 2018 Svijany Open. The No. 2 seed from Slovakia beat the top seed of the €43,000 clay-court event, Pedro Sousa of Portual, 6-1, 6-2 in Sunday’s singles final. Martin sent down five aces, saving all seven break points he faced. He capitalized on four of his own five chances to secure victory in one hour and six minutes. The Bratislava native didn’t drop a set all week. By lifting his eighth ATP Challenger trophy, his first of the season, Martin earns €6,190 in prize money as well as 80 ATP-Ranking points. Sander Gille and Joran Vliegen took the doubles crown on Saturday. The top seeded Belgians eased past Filip Polasek of Slovakia and Patrik Rikl from the Czech Republic 6-3, 6-4 in the final. The encounter lasted only 52 minutes. This entry was posted in ATP Challenger News, ATP Challenger Tour and tagged Andrej Martin, ATP Challenger Tour, Liberec, Svijany Open.